I’m working up to doing the inlay on the actual legs for the Greene & Greene table I’m making. This is a near reproduction of the serving table from the Robert Blacker house, and the inlay is my biggest challenge in the project. So to get ready for doing the inlay I have a laundry list of stuff to get ready. My own personal Sysyphus in three parts. First off, I wanted to cut all of the Abalone shell for the petals. I printed several copies of my pattern, cut out the petal patterns, glued the pattern to the shell and glued the shell to some 1/8″ plywood so I had something to hang on to while sawing. The ply also supports the shell really nicely. Patterns superglued to the Abalone, the shell is Duco’d to the plywood base. Tee plywood gets removed after sawing. I got some new insights into sawing with the Chevy while doing this. Any time I need to steer particularly accurately — like curves and reverses and when I’m starting to get off the line — the secret is to lift almost all the pressure from the saw blade. Understand, that I’m never putting pressure on the blade, I’m always lifting the weight of the frame, this is a subtle thing. In sawing out the parts I messed up two petals, somehow getting way out of control. I re-cut these. Overall I’m pleased with the shell cut outs, I’m off the pattern here and there, but it’s a tiny amount and it doesn’t matter at all as long as the shell fits well into the cavity I’ll excavate for each part. This went reasonably quickly, and with a little background music it was a pleasant way to pass some time. 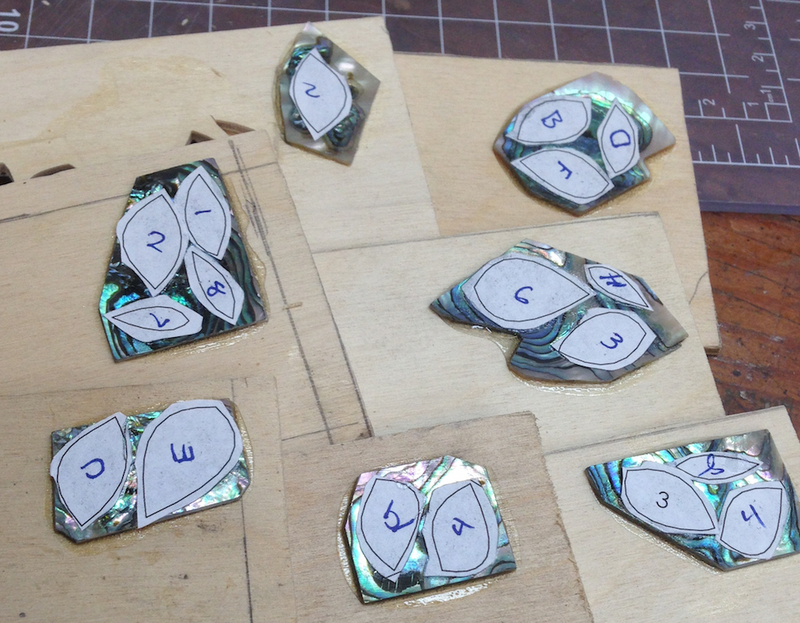 All of the abalone parts cut out for the leg inlay. There will be more for the table top when I get to that step. As I got this boulder to the top of the hill I looked ahead at the next steps. Then legs need to be sanded and have the edges rounded before I can start in on the inlay. Lots of little cleanup tasks to do. I’m not a fan of sanding, I’m thinking of splurging one of these days to get a HEPA vacuum and sander combo as I really hate getting covered in fine wood dust. As the boulder rolls down the hill I was thinking about transferring the inlay layout to the leg. For the practice piece I used a technique I’ve used before. I covered the wood in blue tape, then used spray adhesive to glue the pattern to the blue tape. That works OK for routing the grooves and positioning the petals relative to the stems, but it’s a “fail” for scribing the outline of the shell pieces to the wood. 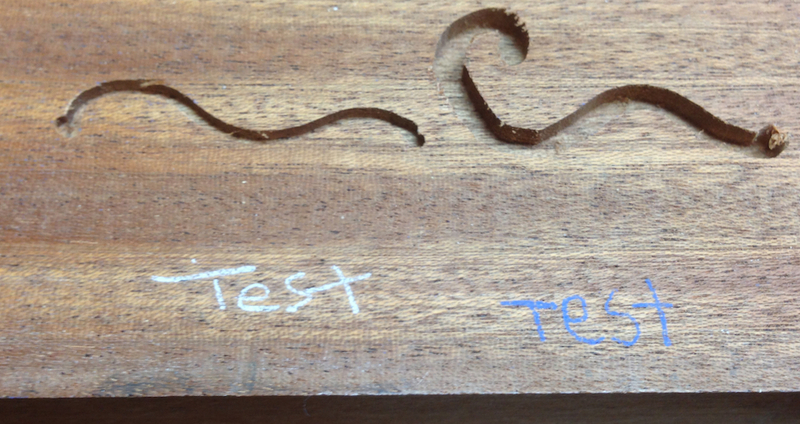 So I am going to try transfer paper to trace the pattern onto the wood. I did a quick “test” to see how the stuff works, and it surprised me. The transfered marks are clear and crisp (crisp enough for routing the stems and positioning of the petals). They also don’t rub off, I was concerned they would be smeary like pencil or carbon paper. I’ll Duco the petals to the wood and scribe around them to get the exact shape for the cavity I need to excavate. Transfer paper and ball-end scribe. The paper comes in half a dozen different colors, I got white and blue which should cover most woods I work with. I like the Sisyphus analogy.